I recently shared that I'll be heading home for Christmas this year and I'm so excited to continue our family tradition of spending time with my Grandmother on Christmas Day! It's one of the most important parts of celebrating Christmas in our family. I can remember Christmas at her house as an itty bitty child, it was a big hooplah with Santa coming to visit and my favorite foods being served in portions large enough to feed a few armies. My Grandma is an epic cook, one of those women that is just a natural in the kitchen and seems to enjoy spoiling her family with ridiculous amounts of tasty, homemade from scratch meals. Anything she makes is so incredibly delicious and I'm thinking it's because she makes it with so much love. I know that sounds cheesy but it's true. 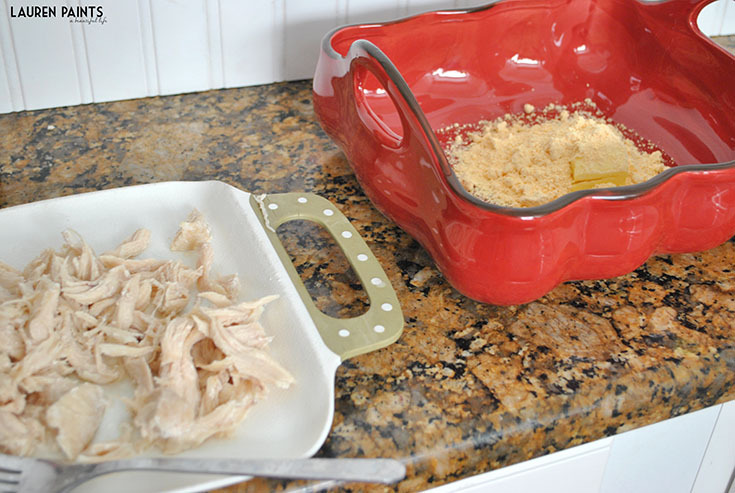 This year I want to help out in the kitchen so I'm making a new recipe, a recipe that is bound to become a new family tradition because I'm making it with Love and Betty Crocker™! 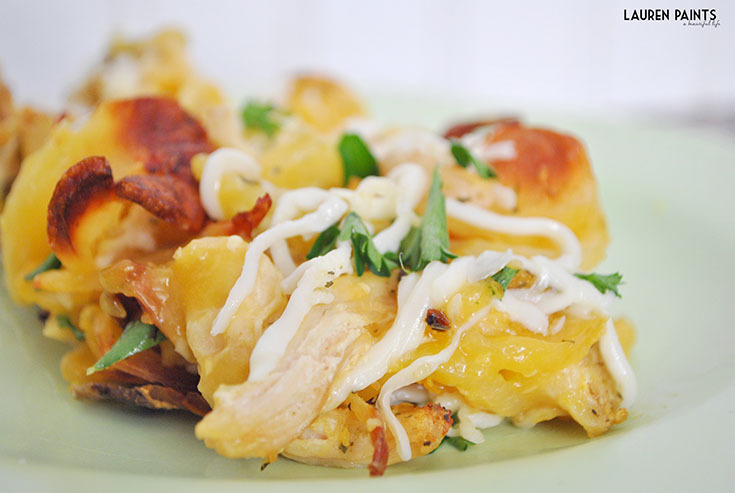 This Extra Cheesy Italian Chicken & Potato Casserole Recipe with Betty Crocker™ Potato Mix is so easy to make and is packed full of delicious Italian flavors and loaded with enough cheese to blow your taste buds away. The perfect stand alone meal when you are in a hurry or it could be served as a side dish on a holiday (like I plan on doing) - it's all up to you! It's time for you to #GetYourBettyOn so you can have a delicious dish and spend more time with your family (and less time in the kitchen). 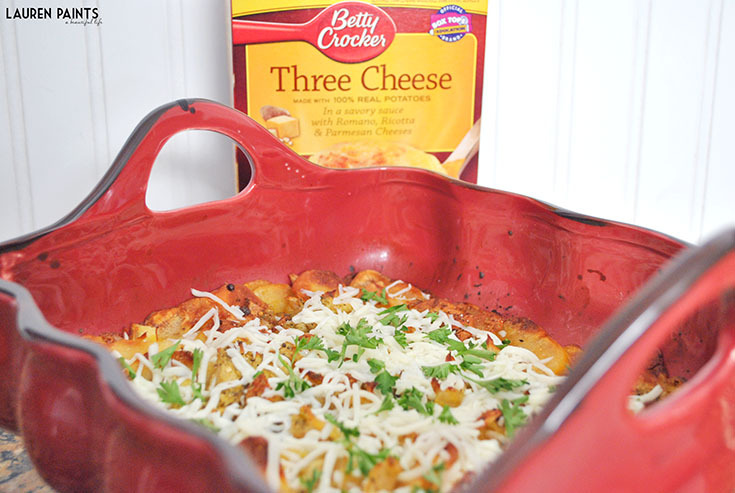 Betty Crocker™ casserole potatoes bake in just 20 minutes and make some of the most delicious and convenient meals and side dishes your whole family will love. Betty uses 100% real potatoes for the best flavor possible, so be sure to give each of the 11 different varieties of casserole potatoes a try and give your family and friends something to talk about this holiday season! You'll begin by preheating your oven as instructed on the package (400 degrees). 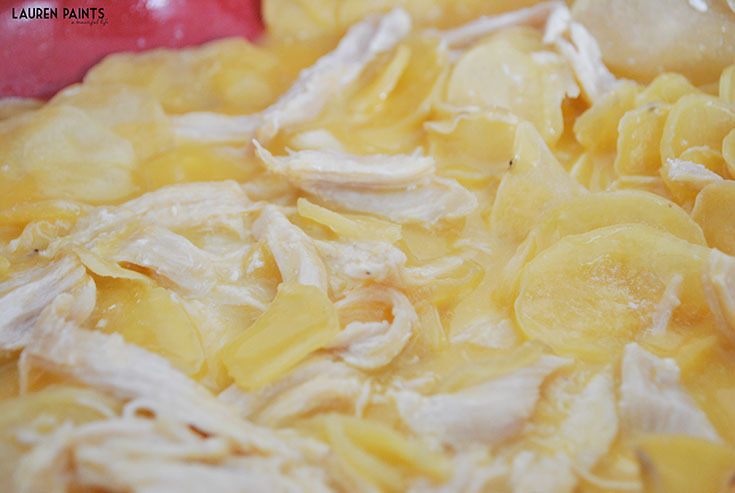 Prepare the potatoes as instructed, adding in boiled and shredded chicken when you place ingredients in casserole dish. Bake as instructed and remove from oven and stir. 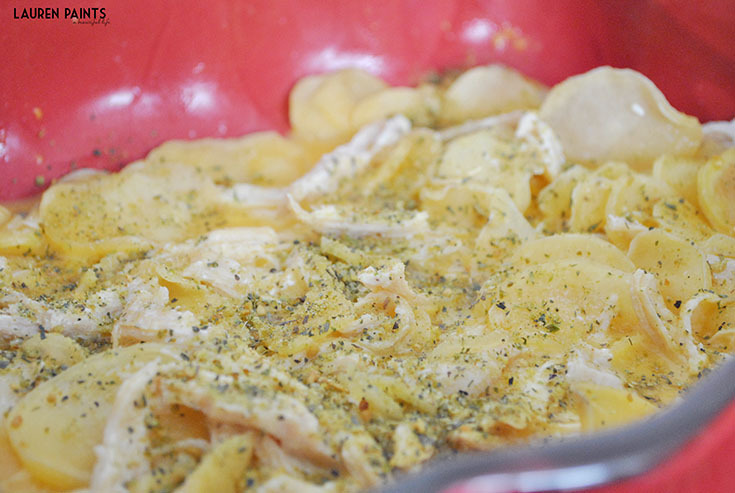 Sprinkle spices over the top of potatoes and bake for 2 more minutes. 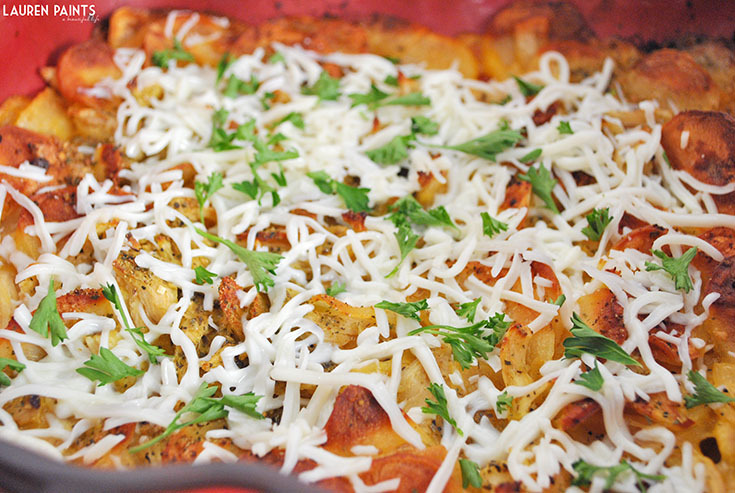 Remove from oven and immediately add shredded cheese and fresh parsley. 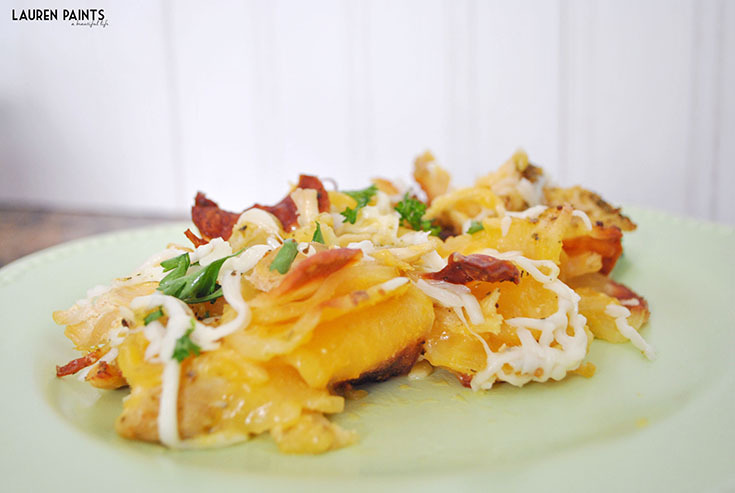 That's it, your ridiculously cheesy potatoes are done! It's that easy! I think when I make this next week I'll add in some mushrooms and bacon, because I think those additions sound like they would make this casserole even more delicious - if that's even possible?! 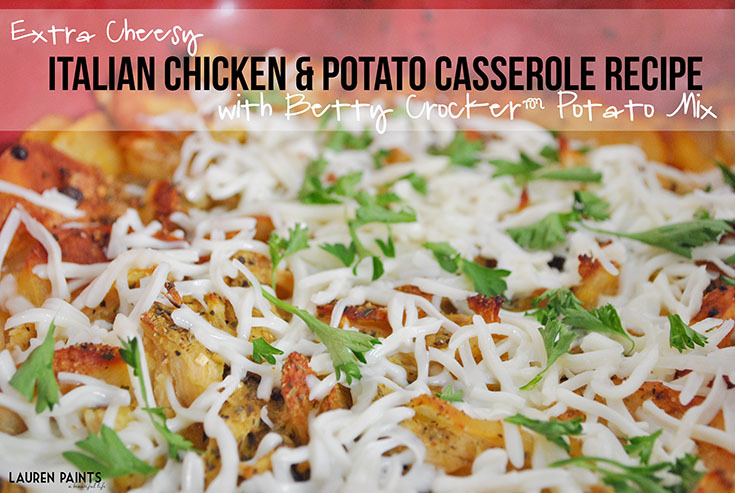 That's the beauty with Betty Crocker™ Potato Mixes... You can make so many varieties of dishes so incredibly easily!You can't even begin to understand how cheesy and amazing this Italian Chicken & Potato Casserole is; I mean it's the ooey-gooey, melt in your mouth, nearly-like-mac-&-cheese-but-even-better type of recipe. 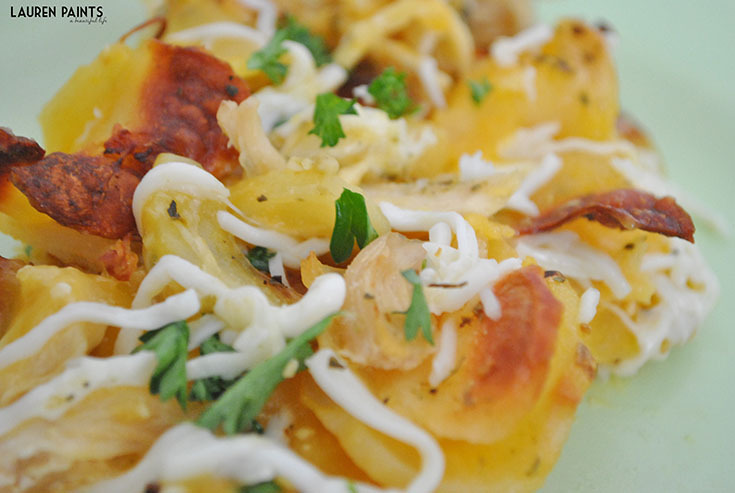 The texture of the potatoes combined with the roasted garlic, parsley, and variety of cheese flavors really make this dish POP! Don't believe me? Try this dish for yourself! 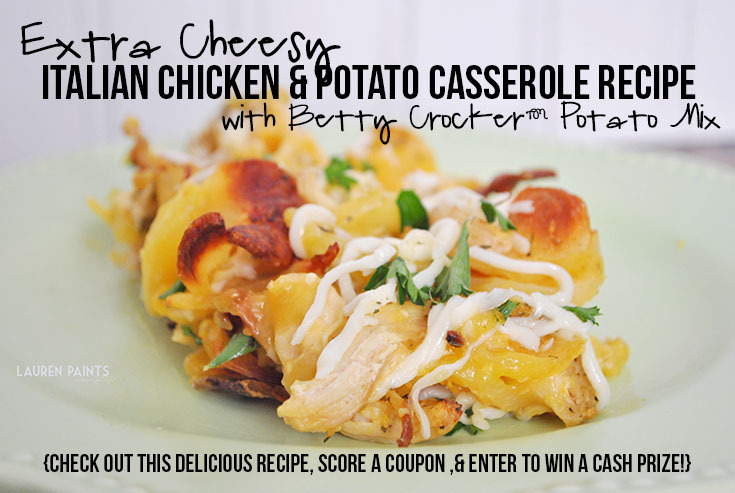 Betty Crocker™ is offering a 50 cent off coupon so you can indulge in some of their delicious potatoes! You'll want to print your coupon now so you can grab a bag full of Betty Crocker™ Potato Mixes next time your at the store for a HUGE discount! Disclosure: The information, products and the gift card being given away were all provided by Betty Crocker™ through Linqia, regardless I only recommend products or services I use personally and believe will be good for my readers. Must be 18 or older to win. This promotion is in no way sponsored, endorsed or administered by, or associated with, Facebook, Twitter or any other company mentioned above. You understand that you are providing your information to Lauren Paints | a beautiful life and not to Twitter, Facebook, or any other entity, I will not use your information other than to e-mail you a winning notification if you are the chosen winner. Enter using the Giveaway Tools form above. Void Where Prohibited. Please note that Lauren Paints | a beautiful life and all other bloggers participating are not responsible for sponsors that do not fulfill their prizes.